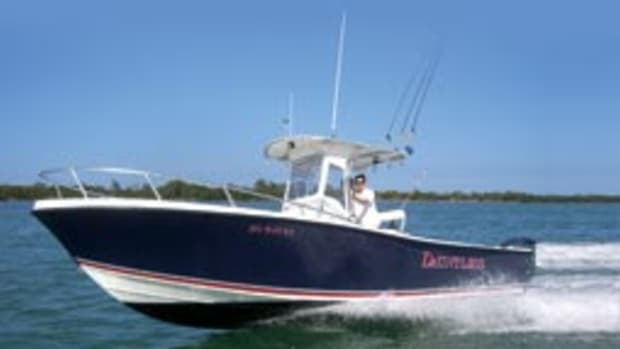 Bob Bell&apos;s 1992 Dusky center console had performed admirably over the last 16 years, taking him on countless fishing trips and several runs from his home port in North Palm Beach, Fla., to the Bahamas. Bell wanted to take larger groups of family and friends on his runs to the Bahamas, but the 23-foot Dusky was too small. 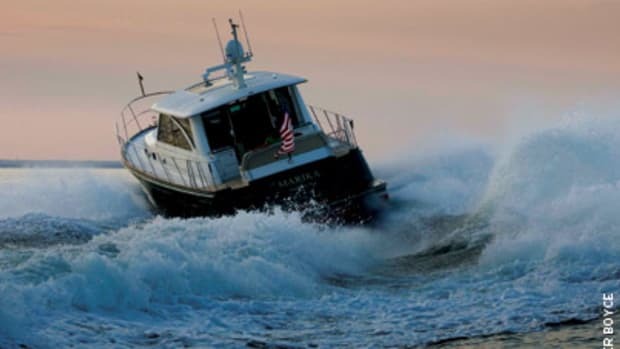 A new center console in the 30-foot range could exceed $200,000, and with a son in college and a daughter headed that way next year, a new boat was out of the question. 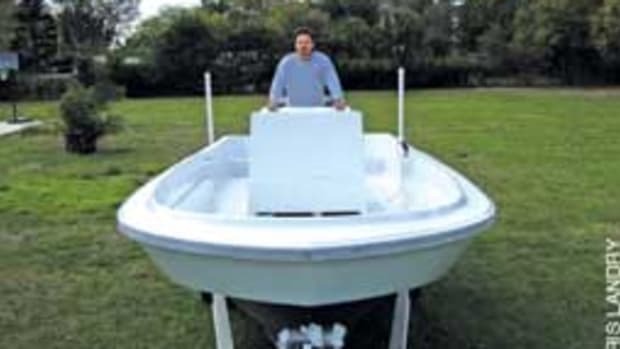 Like so many others in this value-conscious economy, Bell, 46, looked to the used-boat market for a less-expensive alternative - something that with a reasonable amount of work and expense could become the boat that would satisfy his needs. "I looked at Bertram Moppies," says Bell, who owns a computer integration business. "I looked at Rampones. I looked at a few SeaVees. I looked at Intrepids. I was just looking for something that was a good bang for the buck, that had a really nice, solid infrastructure and a good ride." At first glance, the 1995 Jupiter 31 Open that Bell found appeared to be a "nightmare" of a project, he says. "The boat was in disarray," he says. "It was tired-looking and run down. All the electronics were taken off. The console had a gaping hole in it. It basically sat and really hadn&apos;t been taken care of for quite awhile." 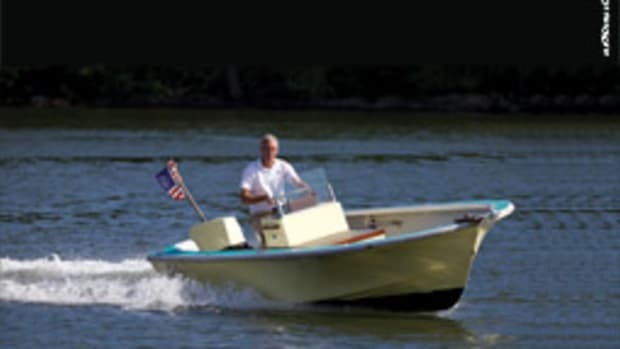 On further inspection, however, it became clear to Bell and his boatbuilder friend Robert Helmick that the flaws in the center console fishing boat were mostly cosmetic. "It was a disaster, yes, but not mechanically, just aesthetically," says Bell. 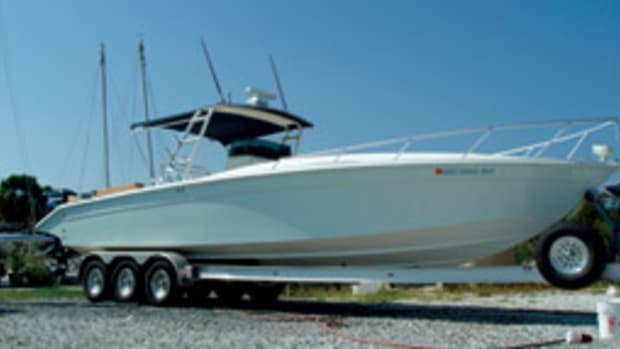 "Jupiter is a premium product, so I told Bob that it was a boat worthy of the work and worthy of the expense," says Helmick, a co-founder of Yellowfin fishing boats who now runs a boat repair shop and builds a 34-foot express, the Tortuga 34, out of Sarasota, Fla. (www.tortugaboatworks.com). Bell bought the 15-year-year old Jupiter with Mike Kretschmer, a friend with a vacant boat lift in North Palm Beach. Together, they hired Helmick to give their "new" boat a facelift - a job initially estimated at $6,000. When Kretschmer learned his friend had found a Jupiter 31 with mostly cosmetic issues, he was immediately interested. "I&apos;ve always liked the boat," says Kretschmer, 50, who resides in Jupiter, Fla., and owns an insurance agency. "I&apos;ve always liked the lines. My wife is the same way - she likes the look of the boat. I grew up in Florida. I&apos;ve been boating since I was 8, so I know about Jupiters." Above all else, it was the Jupiter&apos;s proven deep-vee hull that sold Bell and Kretschmer on making the purchase. "The ride, to me, is as good as it comes," says Bell. "The boat runs real flat. You can punch out at 12 to 15 knots on that boat without the bow jumping up on you." The Jupiter has an LOA of 33 feet with its engine bracket, which is not part of the running surface, a beam of 9 feet, 6 inches, and weighs 5,200 pounds dry. It&apos;s built for fishing, with a raised foredeck, toekick along the gunwales from bow to stern, flush-mounted hardware, and plenty of lockers, rod holders and insulated fishboxes. "This is truly the boat that put us on the map," says Jupiter vice president of sales Todd Albrecht. "We wouldn&apos;t be where we are today without it. The 31 has a cult following, and I&apos;m not surprised someone is putting some money into a used one." The Jupiter 31 now being produced, Albrecht says, is essentially the same as those built in the 1990s, with an identical hull form - same length, beam and deadrise. The boats in the &apos;90s were built with solid glass bottoms and cored sides, the same as today&apos;s 31. "Of course, the materials and resins have improved over the years, and we use more glass than they did in the &apos;90s because Carl [Herndon, Jupiter owner and president] wanted the boat to have a lifetime warranty," says Albrecht. Bell, Kretschmer and Helmick took the Jupiter on a 2-1/2-hour sea trial in the Gulf of Mexico. "We ran around in 3- to 4-foot seas," says Bell. "We ran at different rpm and different speeds. It rode nicely. No strange noises. We were looking for something major." They had the boat put in the water the night before the sea trial to make sure there were no leaks or anything out of the ordinary. Helmick also checked the hull for structural integrity while it was on the Travelift hoist. The goal was to not only breathe life into the old Jupiter but revive it to near-new condition. The work was cosmetic, but there was a lot of it: a severely faded gelcoat; cracked, faded and mildew-stained cushions and bolsters; corroded hinges and other hardware; rust stains in the deck compartments; old bilge pumps, hoses and fittings; a beaten-up tuna tower. "There were, God knows man, a thousand screws in this thing, between cup holders and attachments and snaps for the old Isinglass on the boat," says Bell. "Aesthetically, it drove me out of my mind, and Robert told me it wouldn&apos;t be that bad of a job to remove them and patch them and regelcoat." When Soundings paid a visit to Helmick&apos;s Sarasota shop, the hull and liner had already been compounded and waxed, and the tower had been pried free from the deck and was on the concrete in Helmick&apos;s shed. "It&apos;s a beautiful tower," says Bell. "It&apos;s well-built. The design of it is fantastic, and it has a gorgeous hardtop on it. We thought, Man, we can really make this thing look new if we rehab the tower." That part of the project took five steps: 1) grind out the screw holes that served as attachment points for the canvas, 2) have a welder fill the holes with aluminum, 3) grind down those welds, 4) sand blast the structure, and 5) have it powder-coated white. The hardtop was a separate endeavor. The old rod holders were removed, and the top was completely refinished with Awlgrip. Its top side was coated with non-skid for traction at the upper helm station. The hardtop and tower were unanticipated expenses, but Bell and his partner deemed them necessary to reach their goal. And with Helmick on the project, the two men were confident they&apos;d succeed. Helmick put careful thought and planning into the replacement and installation of every component. Case in point: the coaming bolsters. Helmick replaced the old bolsters, which had a smooth exterior, with bolsters that have vertical pleats. "The pleats help hide the wear and tear," says Helmick. "If you get a hole in the smooth type, it sticks out like a sore thumb." Helmick also changed out 24 chrome-over-bronze strap hinges, most of which were on hatches, with 316 stainless versions. The old hinges had lost their chrome and turned green. Also, the stainless-steel rubrail was swapped out with a "co-extruded" Barbour rubrail with a hard base and a soft, flexible insert. The last piece of the puzzle was the electronics. 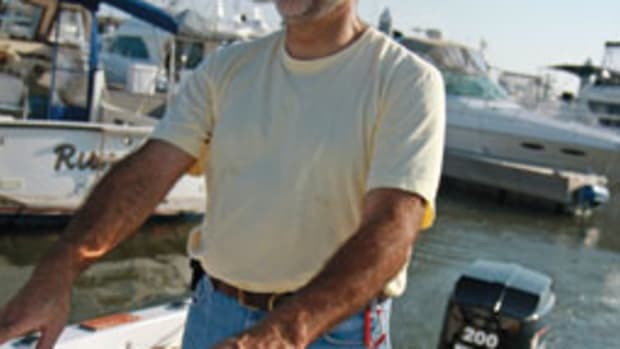 Bell, through his computer business, also has his hand in the marine industry, implementing computer technology aboard yachts. 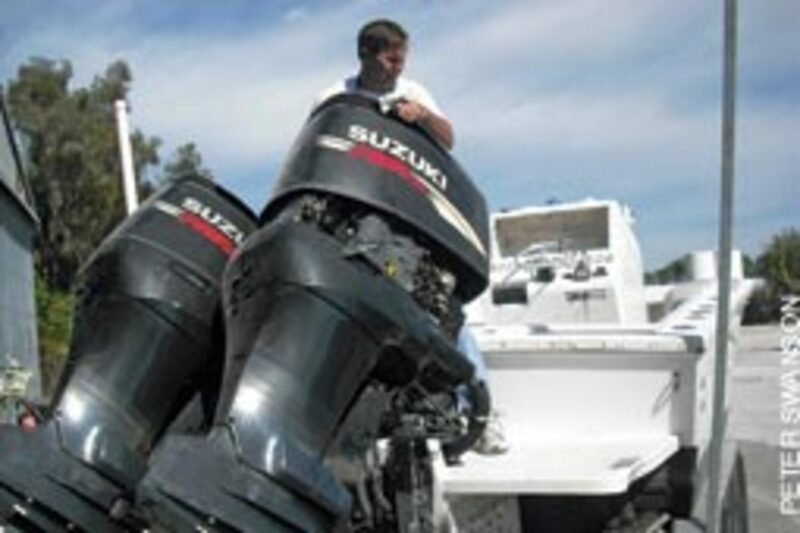 "I work closely with several of the large marine electronics vendors here in South Florida," he says. "I told them about the boat. We came up with the idea of finding a good used [Furuno] NavNet system." 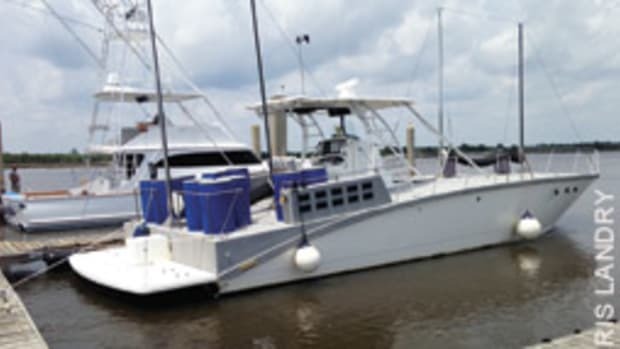 One of his contacts, John Myer, general manager of Commercial Marine Electronics in Pompano Beach, Fla., found a 2006 NavNet vx2 with a 72-mile radar and a new broadband sounder. "It should give us everything a sportfisherman would have," says Bell. "We really have some nice tools to run over to the Bahamas or do some swordfishing or bottom fishing here. It has a 10-inch full-color screen. We may add a 7-inch [display] up in the tower." The rehab project will probably end up costing Bell and Kretschmer more than they had originally planned - about $10,000 total (which does not include another roughly $5,000 for the electronics package). "It&apos;s still a real reasonable amount based on this type of boat, and if we ever do want to get rid of it, we&apos;ll have a premium boat for sale," says Kretschmer. They were looking forward to launching the boat around Christmas. 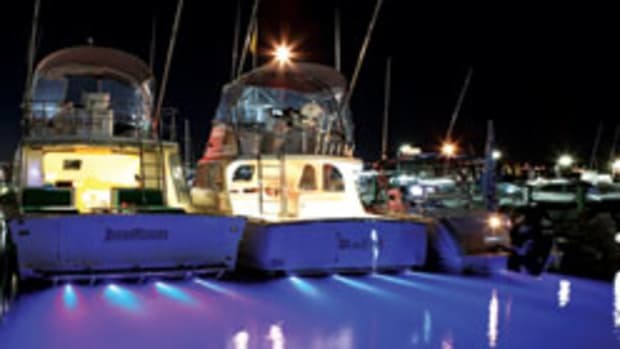 "This shows you can pick up an older [boat], and if you do it right, you&apos;ll turn out with a boat that, driving down the Intracoastal or in the ocean, people won&apos;t be able to tell if it&apos;s brand-new or 15 years old," says Bell.